CD and art print bundle. Limited edition album and art print bundle. The full colour album artwork printed on high quality 12"x12" paper, signed. Seahawks return with their deepest album to date. A masterful blend of Berlin-School electronics and post ECM New Age fusion. Finis Africae meets Harold Budd downtown. 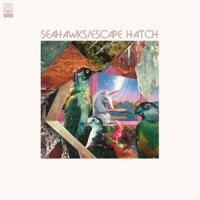 Escape Hatch is the fourth studio album by Seahawks, recorded over the last 18 months and drawing inspiration from Innovative Communications Berlin School electronics, ECM and Windham Hill releases by the likes of Mark Isham, Jan Garbarek and Interior and the New Age synth sounds of Iasos, Deuter and William Aura. The album opens with sheets of soft white noise, which give way to Budd like treated piano and fretless bass before super saturated saxophone tones and rippling sequences cascade over the listener like a summer downpour. Seahawks trademark tropical vibes continue throughout the album but there’s a constantly changing panorama of moods and tones, from the deeply emotive Missed with its widescreen synth and sax interplay that recall Vangelis’ Blade Runner soundtrack to the epic scope of White Horses with it’s almost Popul Vuh like mantric outro and Starways it’s distorted flugel horn like a ghost from Talk Talk’s Spirit Of Eden. At the very end of the (CD) album there’s another twist. A cover of the obscure Balearic hit Valparaiso by Paula Moore, with a Nassau groove, surprise guest vocal and a twinkle in its eye, it provides a suitably eclectic yet ethereal ending. Once again Seahawks have created a world to get lost in, an Escape Hatch - if you need it, come get it, here it is. Patrick says: After a brief hiatus, everyone's favourite ocean goers return with their own expansive and immersive take on IC/ECM. The ensemble's trademark aquatic sonics and submerged soundscapes remain, now redirected towards new age harmonics and Fairlight fantasies.